Nicole Bauguss is a designer, builder, artist and educator whose work is an anthropological, sociological, environmental and artistic study of what we value and what we dispose of as individuals within our communities. She investigates how repurposing materials and ideas impacts our lives, histories and ultimately the environment. In 2013 she completed her MFA in Visual Art at The University of North Carolina Chapel Hill. She received her undergraduate degree in Design and Visual Communication from Virginia Commonwealth University in 1999. 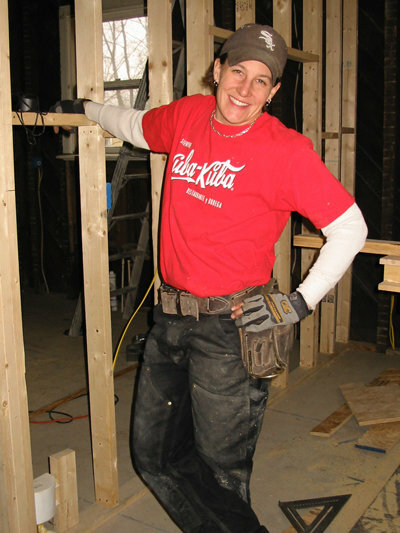 She worked as an Exhibit and Package Designer in Richmond Virginia before abandoning the use of computers to pursue a career as a builder focusing on Historic Preservation. In 2001, she founded RipRoost an integrative DesignBuild Company focusing on Eco-Conscious Building Practices and Materials reuse. Her artistic explorations fuse her work as a Visual Communicator and Historic Preservationist, spanning from full historic residential renovation projects, the creation of tactile functional furniture and boxes to large scale integrative installations, site specific performance projects and set design for dance. Nicole continues to investigate the current issues facing society by conceptually integrating sustainability and eco-conscious practices into questions of how we move through life and what our lives reflect about who we are individually and collectively. Bauguss resides in the mountains of Western North Carolina where she continues to work as a Creative Consultant, Spatial Designer, Visual Artist and Builder.